We are delighted to be presenting the work from a selection of artists from across the UK who are currently benefitting from being part of the Bloc Projects Members Scheme. 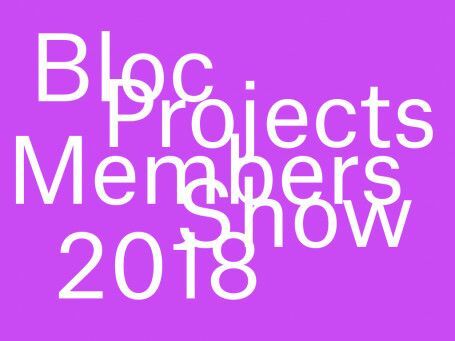 This annual group exhibition is a fantastic chance to see artists testing the boundaries of sculpture, painting, video, installation, and a range of other mediums and techniques, and forms a key part of our yearly curated programme. This year the participating artists have been selected by guest curator Kim McAleese. Over the past decade Kim has worked on a wide range of projects across the UK and is currently the Programme Director at Grand Union, Birmingham. Kim has been invited to make the selection due to her pioneering approach to curatorial practice and her eye for emerging talent.